Osler's crystal fountain stands in a pool of goldfish at the intersection of the nave and transcept of the Crystal Palace in Sydenham Hill. It stands 27 feet tall and is composed of 4 tons of glass. 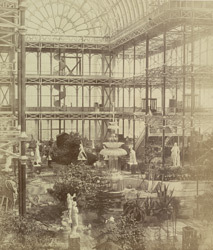 The Crystal Palace was originally created by Joseph Paxton to house the Great Exhibition of 1851 in Hyde Park. It was reconstructed and enlarged in Sydenham, south London. The first column was raised on 5 August 1852 and the palace was opened by Queen Victoria on 10 June 1854.